The same team that brought you the instant sell out Satanika X, now serves forth another helping of extreme Japanese Dojinshi madness. Hell's assassin Igrat gets the full Wing*Bird treatment in this deluxe oversize edition. Don't get caught short on this one, it's probably your last chance. Money Order or Check. CA. Residents must add 8.25% sales tax. 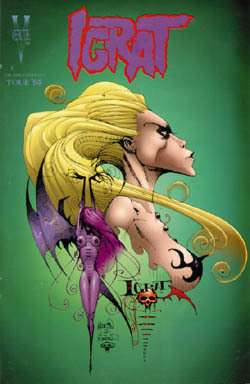 The surprise popularity of the Igrat character from DSatanika, has spawned her own two issue mini-series written by Glenn Danzig and illustrated by Eric Canete (of MTVs Aeon Flux fame). This two issue mini-series tells the beginings and origin of how Igrat became Hells Assassin angel. Igrat performs her first hit as Hells Assassin. Cover by Martin Emond. of Hells Assassin, the one and only, Igrat. the Danzig signing tour. It features a special variant cover by Martin Emond.